Historical Western romance Mail Order Mystery, the first novel in Robin Deeter’s popular Chance City Series, is now available as a free Kindle e-book. 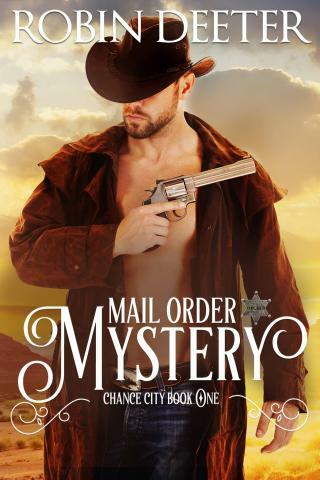 Robin Deeter, a bestselling author of historical western and contemporary romance novels, announced an updated Kindle version of her popular Mail Order Mystery, the first title in the Chance City Series. The novel, which follows the intriguing love story between a lady farmer and a former detective, is now permanently available for free on Amazon. More information can be found at https://www.amazon.com/dp/B01EIOL840. The protagonists are Leigh Hawthorne, a widow and farmer, and Cyrus Decker, a former detective. After being discharged for breaking Pinkerton rules, Cyrus decides to settle down as a rancher and – since he knows nothing about farming – is looking for a woman with ranching expertise. Leigh answers his letter and what follows is an exciting, page-turning adventure. The novel was met with an enthusiastic response from the Amazon community, with a 4.4/5-star rating out of more than 225 reviews. Mail Order Mystery is the first book in the Chance City Series of historical western romance novels. An avid reader and writer, Robin Deeter is the bestselling author of the Chance City Series and the Paha Sapa Saga, and also involved in various multi-author novel series. More on Robin’s work can be found at http://bit.ly/RDeeterAmazon and https://www.facebook.com/authorrobindeeter.